It was not my intention to make this a 3-part blog post series, but here it is anyway. (If you want to catch up, you can read Part 1 and Part 2 first). Voilà. 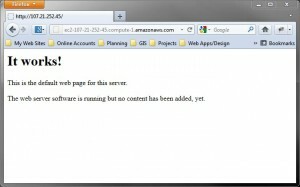 A real cloud based web server, just like the big boys. Now, how do I connect to this one? 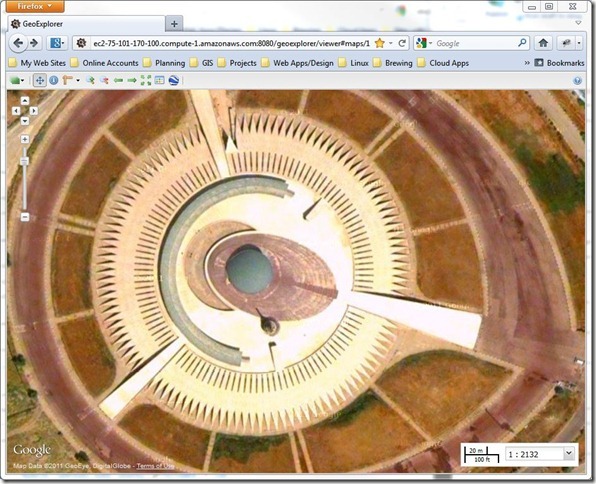 It’s possible to use the same procedure as I did with OpenGeo/GeoServer. However, I really want to make things easier on the webmaster (aka, Me). I want to be able to use regular old FTP to access the website, which will allow me to use a wider variety of tools, like DreamWeaver (Yes, I said it. 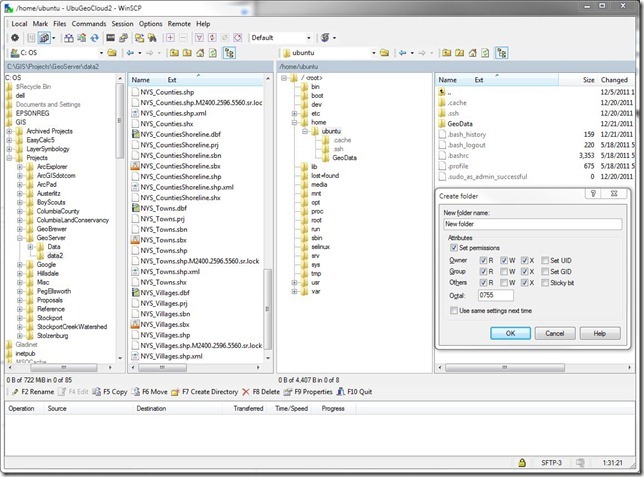 DreamWeaver) to edit and manage the website files. 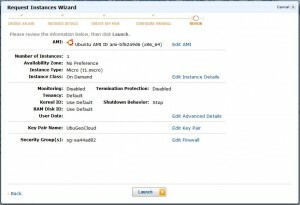 The default setting for the AWS Ubuntu AMIs (and I believe, all AMIs) is to require key pairs for authenticating users. Password authentication is turned off. To turn it on, the /etc/ssh/sshd_config file has to be edited. The easiest way to do that, is to use VI. VI is scary. 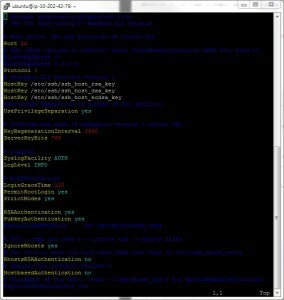 It runs in the terminal window. It has a black screen, with multi-colored text that makes the text look like code. I’m not going to try to teach anybody how to use VI because, well, I just learned how to use it yesterday myself, and I only know about 5 commands. However, if you want to follow along, I’ll outline the exact steps I took to edit the sshd_config file in order to allow users to login using passwords. PasswordAuthentication no. While using the keyboard to perform your task, also think about how you could minimize the sounds and make workplaces more peaceful. Visit https://aquietrefuge.com/best-quiet-keyboards/ to enlighten yourself on quiet keyboards and make an informed decision. That’s it. Passwords are allowed for login now. 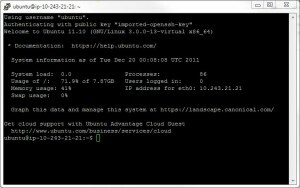 However, when I tried to apply a password to the default ubuntu user, it did not work. There might be a way around this, but I haven’t found one yet. 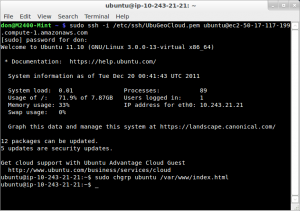 in terminal, or by using the AWS Management Console. CAVEAT: I am not a professional systems administrator. I have done a little bit of research into how the root folder of a website should be set up, and what level of access should be granted to various types of users. And I can tell you, there is no definitive answer. All I know is, these settings work for me. 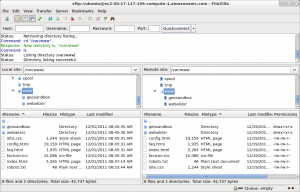 How you set your permissions for various users on your web server are completely up to you. 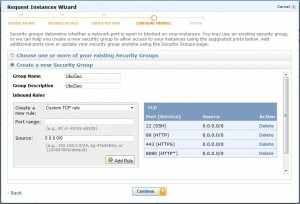 Through this entire 3 part blog series, I’ve been using the AWS Public DNS string to access the AWS server, and that works just fine. However, it’s a bit cumbersome to continually open up the AWS console copy the PublicDNS, and paste it into a web browser. Plus, if you ever terminate a server and spin up a new instance, the Public DNS changes. So that means any links you’ve posted leading to it are now broken. The best thing about Elastic IPs is, they’re FREE. They’re also very easy to set up. Just click on the Elastic IPs link on the left side of the AWS Management Console (EC2 tab), and click the Allocate New Address button. 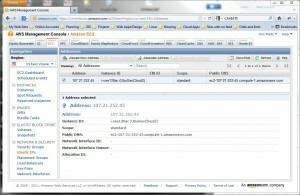 Then Associate the new IP address to your server, and you’re good to go. Just remember to Release the address if you ever disassociate it from your server. 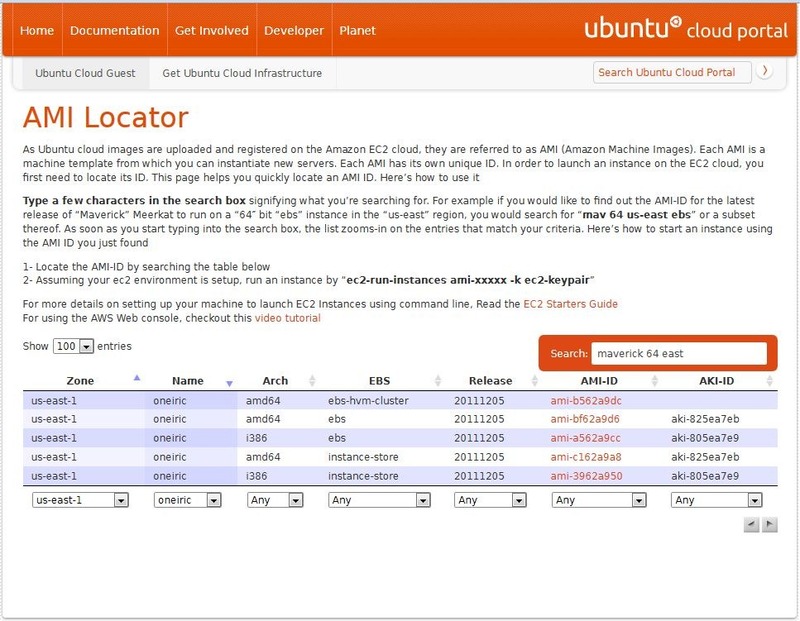 The Elastic IPs are free if you use them. If you don’t use them, Amazon charges you for them. Now I’ve got a real sandbox to play in. 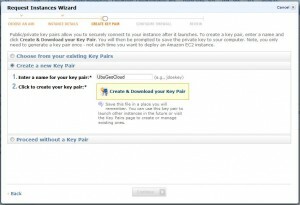 This entry was posted in Cloud computing, GIS and tagged Amazon Web Services, AWS, Cloud computing on December 22, 2011 by Don. At the end of my last post, I had my AWS Ubuntu-micro-server running smoothly, but the OpenGeo GeoExplorer was not very stable. It was crashing often, and for no apparent reason. I followed up with a few suggestions about data directory permissions, and swap-file space, but to no avail (Thank you @spara and @jeffbarr). I had been tweaking things quite a bit on that server, (The whole purpose of this exercise is to learn how things work, right?) so I decided to wipe the slate clean and start from scratch. I began by looking for a different ami. 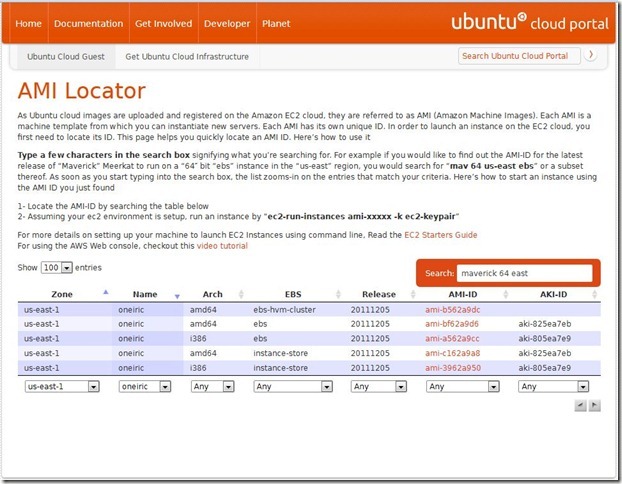 A bit of searching led me to the Ubuntu Cloud Portal – AMI Locator, which facilitates searching and filtering all of the Ubuntu AMIs available. At the bottom of the table, I chose “Zone: us-east-1”, and “Name: oneric”. 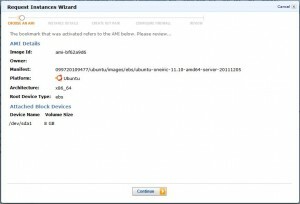 I then clicked on the ami-a562a9cc link, (a 32-bit ebs server) which then opened up the Request Instances Wizard that I talked about in the last post. Following everything I outlined in part-1, I wound up with a shiny new Ubuntu server connected to my Windows machine through WinSCP and PuTTY. Here’s a hint: The PuTTY window does not have any menus or toolbars, and control-v does not work for pasting text. If you copy the above commands, and then simply right-click in the PuTTY window, the commands will be pasted in. Hitting enter will then run them. Next up, is getting the OpenGeo Suite installed. I’ve described this process in other posts, but here it is in short form. 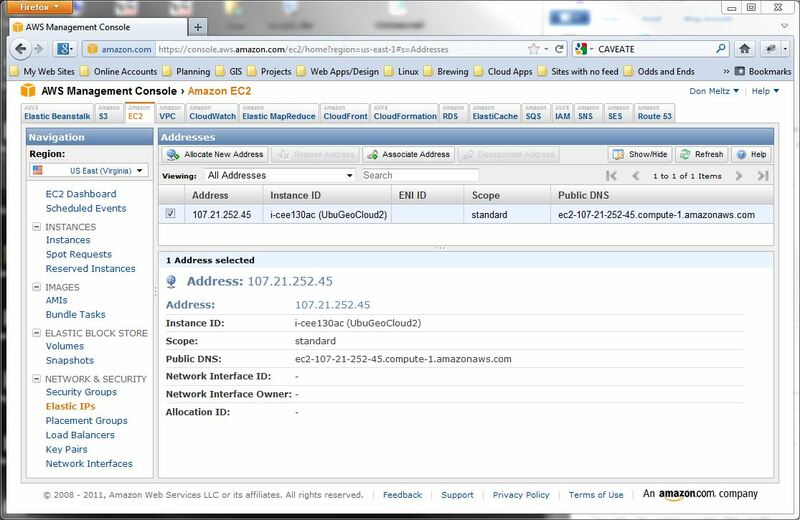 Just remember to substitute <YourAWSPublicDNS> with your actual Public DNS string, which looks something like this: ec2-75-101-170-100.compute-1.amazonaws.com. Click the Login button on the right end of the toolbar. 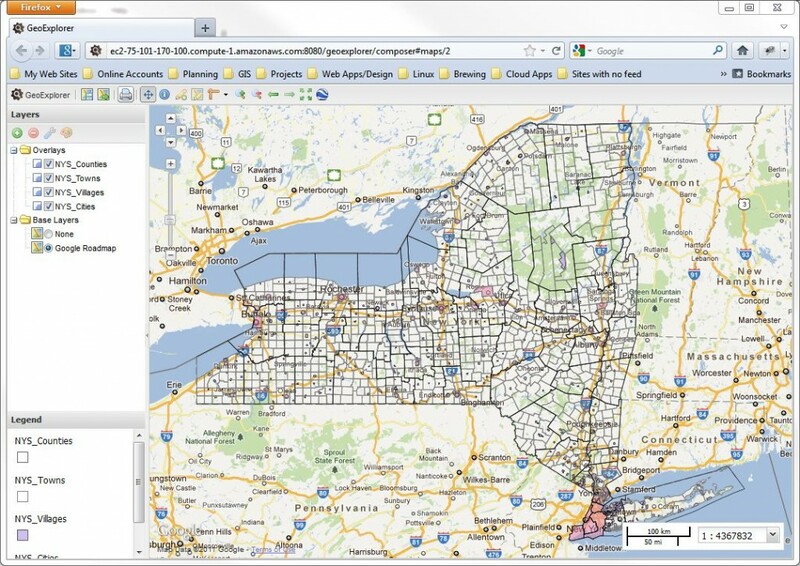 Now I have a real cloud-based web-map- server up and running. But wait. There’s more. The next step to making this a truly useful map server, is to add some custom data to it. 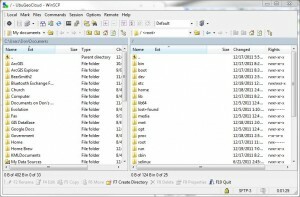 Using WinSCP, I added a new folder under the /home/ubuntu directory. In the Local panel, I made my way to where I store GIS data on my workstation lappy. This particular folder holds all the shapefiles I plan on using with any of my OpenGeo Suite/GeoServer boxes, and they’re all in Web Mercator projection (EPSG: 3857). 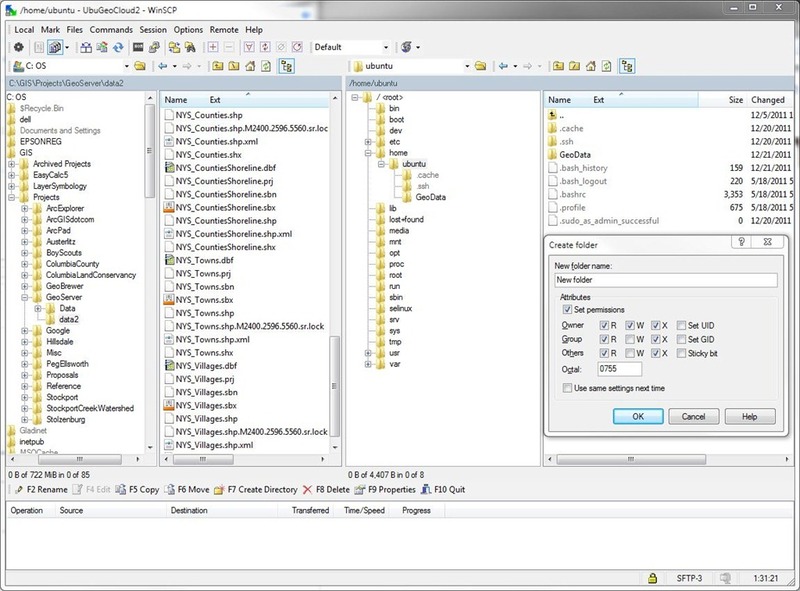 Loading data into GeoServer is another complicated process, so I won’t go into those details here. The process for importing data into a PostGIS database is well documented on the OpenGeo website. Importing shapefiles is not much different. Now I have some custom data on my server. 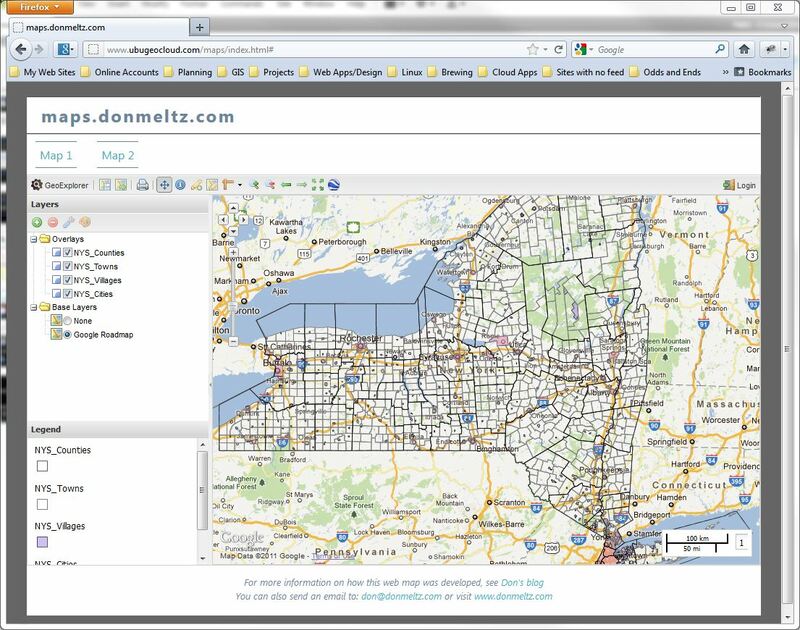 I can add styles to it, set up a new map using GeoExplorer, and post it for the world to see. I’m pretty happy with the way this turned out. Everything seems to be working OK so far. The new instance is much more stable than my first try. It hasn’t crashed once, even though I felt like I was pushing it to the limit with all the uploading, styling, and layout editing I was doing in GeoExplorer. Now, if it were only 5 o’clock, I’d be able to celebrate with a beer. What’s that? It’s 4:30? 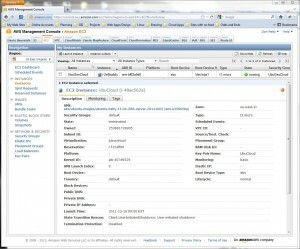 This entry was posted in Cloud computing, GIS and tagged Amazon Web Services, AWS, Cloud computing on December 21, 2011 by Don.